The awards ceremony will be held at Fellowship Baptist Church in Cheney, WA mid-June (date and time TBD). Due to the spread out nature of IronMay, the awards ceremony is meant to be a social gathering to visit and celebrate your accomplishments. We highly encourage ALL participants (including non-finishers), family, and friends to attend the awards ceremony! Can't Make the Awards Ceremony? If you are an IronMay finisher, but are unable to make the awards ceremony, no problem! Please contact us via email to make arrangements to receive your shirt and/or awards. If there are several IronMay finishers in your area and you are interested in hosting your local own awards ceremony, please contact us and we may be able to help facilitate such an event. There are two types of shirts offered: Finisher shirts and Champion shirts. All shirts are adult-sized, unisex fit. All IronMay individuals and teams that complete at least 1 ironman-distance triathlon (2.4 mile swim, 112 mile bike, 26.2 miles run/walk) and have logged those miles on the website before the end of May, will receive a cotton-blend IronMay finisher shirt (all members of finishing teams receive a shirt, even if some members log no miles). If you happen to be an individual or team that receives a Fastest Finish award, most Ironmans award, or qualifies for the Championship division, then you will receive a tech-fabric IronMay Champion shirt instead of the standard finisher shirt. There are several awards up for grabs during IronMay. Some awards are specific to the competition division you participate in. Other special awards are open to all IronMay finishers (individual and team). The currently planned awards are listed below. Fastest Finish: The first individual male, female or team (rec, team, and family divisions) to complete 1 ironman-distance triathlon will receive an IronMay Champion shirt for their accomplishment. 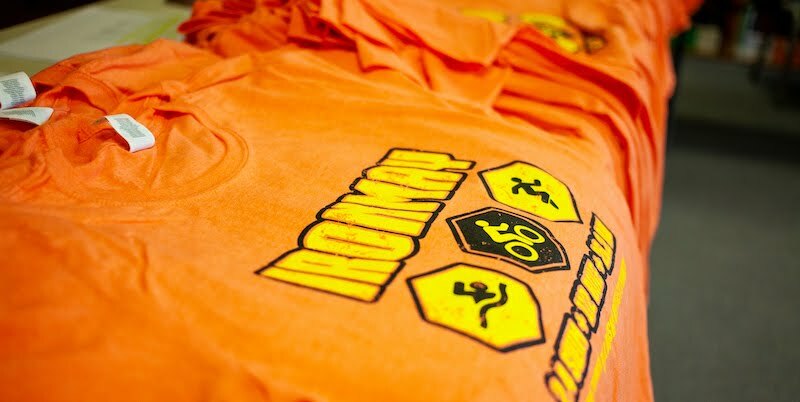 Most Ironmans: The individual male, female, or team (rec, team, and family divisions) to complete the most ironman-distance triathlons during May will receive an IronMay Champion shirt for their accomplishment. The single individual or team to complete the most ironman-distance triathlons in the Championship divisions will receive a special prize, TBD. Multiple Ironmans: All participants or teams who complete 2+ ironman-distance triathlons will receive a special prize for their accomplishment. IronMay Ambassador Award: The participant who yields the most referrals for IronMay will receive a special prize. In the event that there are several standout IronMay ambassadors, we may award multiple Ambassador Awards. Mahi Mahi Award: The individual (across all competition divisions) who logs the most miles overall wins this award. It is named after the first champion in this category, Mahilani Gutina. Youngest & Oldest Individuals: The youngest and oldest individual finishers will receive a special prize. Youngest & Oldest Teams: The youngest and oldest teams (based on average age of all participants) that finish IronMay will receive a special prize. Family Age Spread: The family of finishers that has the largest age spread, such as Grandbaby to Grandma, will receive a special prize. Coolest Team Name*: Our panel of expertly trained judges will conduct an extensive, research-based review to determine the statistically coolest team name (across all team divisions). Or, a few of us may just talk it over and go with our gut instinct! *IronMay is designed to be an all-inclusive, family- and community-oriented event - please keep team names clever, but appropriate! Individuals (teams only when noted) who complete any of the Mini Challenges during IronMay, will have their names entered into a corresponding raffle for prizes donated by our sponsors. Individuals may qualify for each specific Mini Challenge raffle only once, but can qualify for more raffle prizes by completing the other Mini Challenges. There will be several random, but wildly cool, door prizes available to all IronMay participants (including non-finishers) who attend the awards ceremony. Show up! You may just win something.